2011 Paris Spelling Bee Champions, Cheetahs Division: (L-R) Loic Lescoat - 1st place; Anita Youngblood- 2nd place, and Benjamin Macintyre - 3rd place. 2011 Paris Spelling Bee Winners- Gazelles Division (L-R): Yanis Cavrel - 1st place; Thea Voyles - 2nd place. Thirty-nine finalists from 15 elementary and secondary schools competed in the 4th annual Paris Spelling Bee on Sunday, March 20, held at the American University of Paris. Spellers were grouped into two divisions: the Gazelles, in third-fifth grades (CE2-CM2), and the Cheetahs, in sixth-eighth grades (6ème-4ème). Yanis Cavrel, a fourth-grader from Ecole Active Bilingue Victor Hugo, won first prize in the Gazelles group by spelling `Labyrinth’ correctly in the 25th round. Thea Voyles, a fifth-grader from Ecole Active Bilingue Jeannine-Manuel (EABJM), took the second-place trophy after dueling with Cavrel for 10 rounds. In the Cheetahs division, Loic Lescoat, a sixth-grader from EABJM, won first place by correctly spelling his championship word ‘indigenous.’ Seventh-grader Anita Youngblood, from Lycee International St. Germain-en-Laye, took the second-place trophy after a 13-round duel with Lescoat. Youngblood held her ground on words including philippic, tchotchke, aggregate, edelweiss, bezoar, bildungsroman, extravaganza, geothermal, omnivorous, chauvinism and mistletoe, before stumbling on picaresque. Lescoat correctly spelled words including pentathlon, contraband, meistersinger, vivace, maelstrom, pneumatic, algorithm, zeitgeber, mesmerize, fusillade and recidivist. His triumph comes two years after he won first place in the Gazelles group at the 2009 Paris Spelling Bee. Cavrel and Voyles went back and forth for 10 rounds. Cavrel correctly spelled patience, lyrics, plague, casserole and monarch before winning with labyrinth. Voyles earned the second-place trophy by spelling docile, woebegone, gyrate and idiocy before tripping up on buoyant. The third-place trophy in the Cheetahs division went to Benjamin Macintyre, a seventh-grader from La Source. In the Gazelles group, eight spellers tied for third place: Molly Dugan, fifth grade, Ecole Massillon; Bryan Gu, fifth grade, Marymount International School of Paris; Mallory Lewis, fifth grade, American School of Paris; Hugo Scherer, fourth grade, EABJM; Sebastian Macintyre, fourth-grade, La Source; Mizuki Morio, fourth grade, EAB Victor Hugo; Momo Ohji, fourth grade, EAB Victor Hugo; Abdoulie Sarr, fourth grade, EAB Victor Hugo. 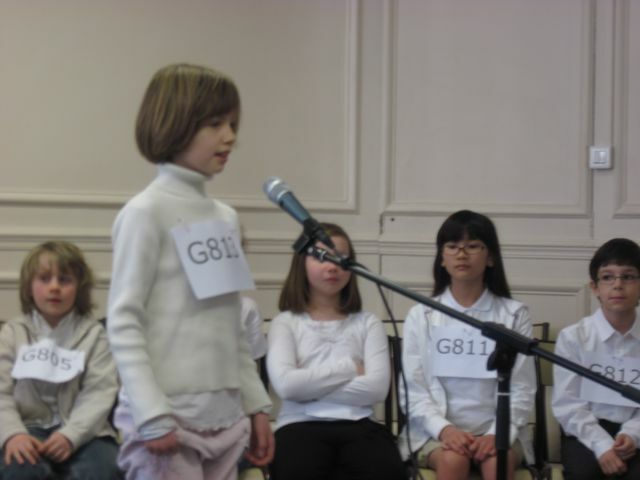 The Paris Spelling Bee is an annual community enrichment event organized by Gifted in France in collaboration with the American Library in Paris. For the first time, the event was hosted by the American University of Paris. Pronouncers for the Gazelles were Charlie Trueheart, director of the American Library in Paris and journalist Anne Swardson. Naida Kendrick Culshaw, the executive-assistant for the ALP, was the pronouncer for the Cheetahs. Celeste Schenck, President of the American University of Paris, was on hand to congratulate the Cheetahs and share an anecdote from her days as a young spelling bee participant. In January, more than 100 students from schools in the Paris region registered for the Bee. Twenty finalists were selected in each division after a preliminary written round was held on January 29. The written round consisted of a dictation of words from a study and surprise list. In addition to the trophy, first-place winners in each division received a one-year family membership to the American Library in Paris along with an ALP tote bag, silver USB key from the Singapore Club, iPhone protector from Phillips Netherlands, a fish-bowl paperweight from Marc Labat and a digital camera from Office Depot. Second prize winners also received a digital camera, iPhone protector, fish-bowl paperweight, international plug adapters and a tote bag from the ALP. All 39 finalists received books from the ALP, as well as a computer mouse from Office Depot and accessories from Marc Labat. 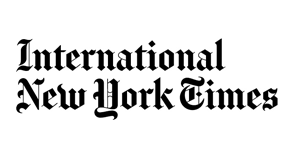 The International Herald Tribune donated flashlight key chains, notepads, and sweets to the children, and the weekend edition of the newspaper for the audience. The Paris Spelling Bee is grateful to the American Library in Paris for its continued support of the Bee and thankful to the American University of Paris for being the host. Special thanks go to the organizers who made this growing event possible: Jude Smith Matisse, Karen Simpson, Ashley Miller, Amy O’Hara, Cate O’Connor of The Roaming Schoolhouse, Rose Burke and Kim Siew Ngoh. Bee organizers are appreciative of the time and energy that Naida Kendrick Culshaw put in helping the team. Additional thanks go to Charlie Trueheart, Anne Swardson, ALP’s Children’s librarian Celeste Rhoads, Janet Sahin (in the US), Cathy Altman Nocquet, Janet Hoffman, Shellie Hollubek, Ghazala Azizullah, Frank Connelly and Chrise de Tournay Birkhahn. Thanks also to former Paris Spelling Bee champs Amelie Matisse (2008) and Shannon Connelly (2010), and three-time Bee participants Emma Newman and Julia Connelly for helping out at the Oral Finals. As the Paris Spelling Bee continues to grow, we are always in need of donors and sponsors to help defray the cost of trophies, venues, prizes and office supplies. We welcome parents, teachers and others interested in helping with the organization of this enrichment activity, which takes months to prepare. Congratulations to all the children who registered for the 2011 Paris Spelling Bee and to those who made it to the Oral Finals. Finally, we want to congratulate Tuli Bennet Bose, our 2010 winner in the Gazelles division, who recently won 2nd place in the city-wide spelling bee in Washington, D.C. Tuli’s family relocated to the US last summer. Gazelles (Left to Right): Momo Ohji and Abdoulie Sarr in foreground, Molly Dugan, Hugo Sherer and Haddy-Jaton Faye in the background.